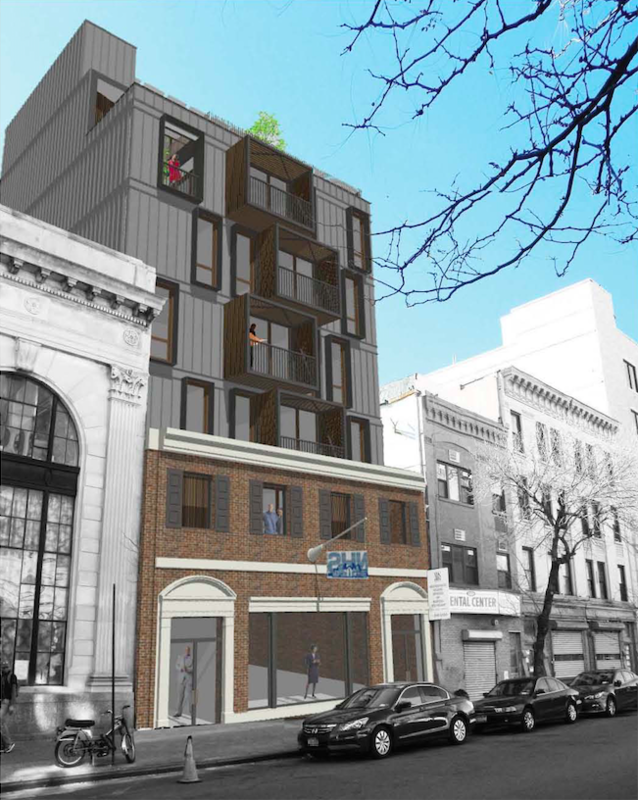 A non-profit that develops affordable homes is expanding its Bed-Stuy office building into a seven-story rental building. 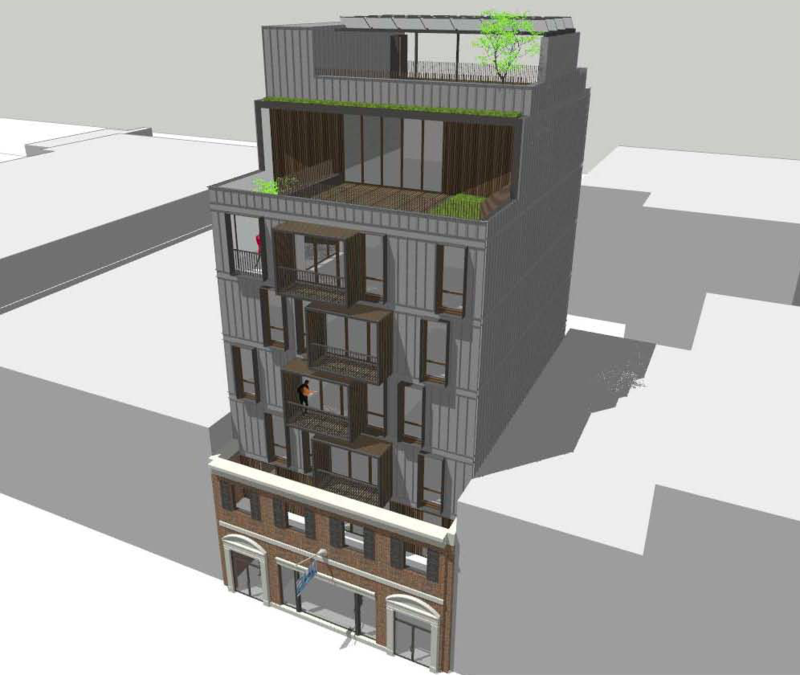 Neighborhood Housing Services of Bedford-Stuyvesant sent along plans to add five stories of affordable apartments to the two-story structure at 1012 Gates Avenue, close to Broadway and the border with Bushwick. The building’s facade – including the cornice, shutters, and curved doorway – will be preserved, and a very modern extension will rise on top. There will be 12 to 13 apartments stacked on top of 4,000 square feet of community facility space on the ground floor. The second floor of the office building will become apartments, and that floor, combined with the extension, will add 8,000 square feet of residential space to the property. Units will range from studios to two-bedrooms. The new part of the exterior will be made of metal, glass, and “composite recycled material,” according to Jeff Charles-Pierre, who works at MK Architecture in the Financial District and serves as the board president of NHS Bedford-Stuyvesant. He aims for the project to be the first LEED-certified development in the neighborhood, with a shared, landscaped green roof and private balconies for four or five apartments. Dennis George Architect is responsible for the design. The design features an unusual mixture of old and new, and the boxy, gunmetal gray facade will certainly stick out in this aging, prewar section of Brooklyn. The two ornate bank buildings next door are architectural highlights in this area, which locals called the Eastern District back in the 19th century. NHS hopes to finance the project with a capital improvement grant from the borough president’s office, and they’ll probably take advantage of city tax abatements offered through HPD’s affordable development programs. 1012 Gates Avenue also benefits from mixed-use commercial zoning (C4-4L), which allows the developer to preserve the ground floor as commercial or community space and build the structure up to a height of 80 feet. 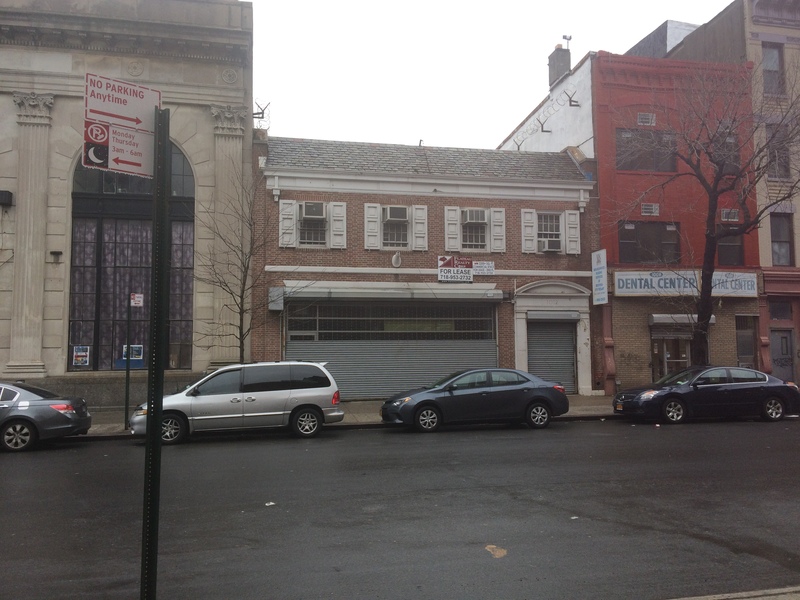 2 Comments on "Revealed: Bed-Stuy Residential Expansion at 1012 Gates Avenue"
Really? Shipping containers for poor people???? Non-profit needs to rethink their choice of architect and attitudes about what is acceptable for low income housing. Send architects BACK to school to learn classical rules and if they can’t actually DRAW free hand they can’t build. TOO UGLY TO BE BELIEVED. Insulting. Get a copy of “Get Your House Right” and save us all more of these eyesores. Super cool use of space! And a clever and forward thinking concept which will likely help lead the way for more of such development in crowded urban areas. Well done.